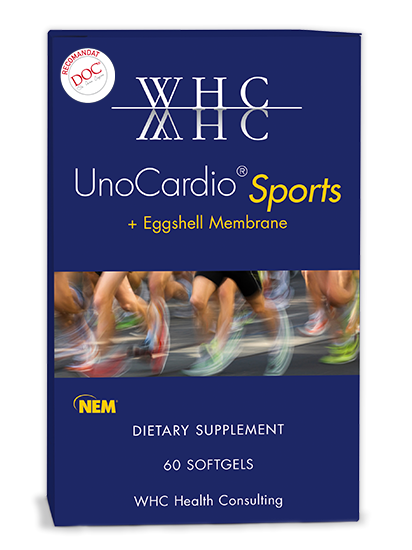 UnoCardio Sports is a nutraceutical complex with a unique formula based on NEM®, eggshell membrane extract, and high concentration of Omega 3 fatty acids, which helps to relieve joint pain, reduce inflammation, protect the cartilage, and maintain the elasticity of tendons and ligaments, and mobility. Are you an active person? Do you run, train at the gym, or play football with your friends? Enjoy the benefits of the movement and reach all your goals. UnoCardio Sports helps keep your joints healthy and train at maximum capacity. The product helps to relieve inflammation and joint pain, muscle pain, alleviates muscular soreness and supports recovery after intense physical effort. UnoCardio Sports is also effective for people suffering from various forms of arthritis, arthrosis or that experience low back pain, shoulder or neck pain. Reduces joint pain Contributes to pain relief caused by intense physical activity in active people and arthritis patients. Reduces inflammation Diminishes joint and muscle inflammation, and helps alleviate the symptoms of muscle soreness. Maintains mobility Maintains flexibility of joints, tendons and ligaments elasticity, ensuring increased protection during exercise. NEM® Eggshell Membrane is a natural source of glucosamine, chondroitin sulphate, hyaluronic acid, collagen and protein, essential for maintaining the health of the cartilage, tendons, and ligaments. NEM is a patented natural product with clinically proven efficiency. Omega 3 fatty acids extracted from deep sea fish oil, EPA (eicosapentaenoic acid) and DHA (docosahexaenoic acid), have anti-inflammatory properties, acting as precursors to compounds that have a calming effect on the body. Thus, they contribute to the reduction of joint inflammation associated with arthrosis and arthritis, as well as to the alleviation of muscle soreness. Persons experiencing persistent knee, hip, cervical, shoulder or low back pains. Deep-sea fish oil rTG concentrate, gelatin, NEM® egg shell membrane, humectant: glycerol, thickener: beeswax, emulsifier: soy lecithin, antioxidant: tocopherol rich extract, color: caramel. *Do NOT take this product if allergic to fish, eggs or soy. If you are pregnant, nursing or using a blood thinner, talk to your doctor before use.